New players only. Wagering occurs from real balance first. 50x wagering the bonus, contribution may vary per game. Available on selected games only. The wagering requirement is calculated on bonus bets only. Bonus is valid for 30 Days from issue. Max conversion: 5 times the bonus amount. Regleman Tout aplike. Blackjack is one of the interesting table games in our lot. We ensure that our players get entertained with the best collection of games. We offer different variants of this game that will keep you going. Strictly Cash Casino also gives these games in a live environment. You can become a registered player at our casino. We provide them with a fantastic 100% welcome bonus up to £200. You can start playing this fantastic table game from the convenience of your homes. You can also opt to play this game in a play for fun mode and once you get a hang of this game you can for the real money mode. These games are also compatible with the iPhone, Blackberry, Windows, and Android devices. - It is a comparing card game and is played between the players and a dealer. - The main objective of this game is to compete with the dealer. - The player needs to get a point higher than the dealer. The important score is 21 but if you get points more than 21 then you get busted, which means you lose the game. - A minimum of 1 player and a maximum of 7 players can participate. - All Face cards such as K, Q, and J are valued at 10 points each. – The cards between 2 to 10 have the same value as per the number. - Surrender: This is a verbal declaration used in the game which terminates the player’s interest in the hand. - Stand: This is also referred to as “Stand Pat” which means taking no more cards. - Split: If there are two different cards of the same value then the player can split it into two hands. – Double Down: The player has the privilege to increase the bet to 100% this is termed as Double Down. This game has an amazing gameplay and is considered to be a classic and very old table game. Make sure you keep dealing with the chips of this game and get potential wins. Vegas Strip, Spanish Blackjack, Vegas Downtown, and Multi-hand blackjack are some of the top notch games available at our casino. 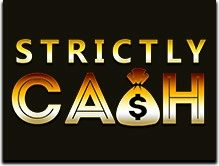 You can register at Strictly Cash Casino and get fantastic 100% welcome bonus up to £200. Hurry register now!